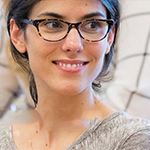 Mitchell Hamline’s robust scholarship program is designed for students from all walks of life. All first-year students’ admission applications are reviewed for merit scholarship eligibility. No separate scholarship application is needed to be considered for a merit-based scholarship, and you will be notified through your acceptance letter for admission if you qualify. 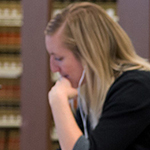 North Star Scholarships provide annual assistance to students who enroll in the law school’s Hybrid J.D. program. 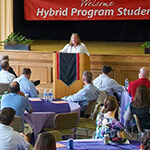 To be eligible for the scholarship, students must demonstrate in their Hybrid J.D. 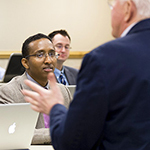 Program Admissions Essay their intent to practice law in an area currently underserved by local lawyers, such as a rural area, a reservation, or a small town or city. Native Justice Scholarships guarantee that eligible students will pay no more than $10,000 in tuition each year. Native Justice Scholarship recipients will also be considered for additional scholarships offered by the school that may further reduce the cost of earning a Mitchell Hamline law degree. or demonstrate in his or her application a strong interest in practicing Indian Law. FAFSA NOT REQUIRED: If you receive a merit-based scholarship and do not wish to apply for federal loans, or work-study, a Free Application for Federal Student Aid (FAFSA) application is not required. Throughout the year, newly available “Named Scholarships” for continuing students will be announced in the Financial Aid section of The Docket. Carefully read the application criteria. Each Mitchell Hamline sponsored scholarship application requires a two page personal statement, a resume, and the Scholarship Application Form. Submit completed applications to the Financial Aid Office.